Brainlight is an experiential artwork that allows us to see one of the most puzzling aspects of ourselves- our minds. Integrating biology, illumination design and technology into an interactive sculpture, cut from perspex and engraved with neural networks. 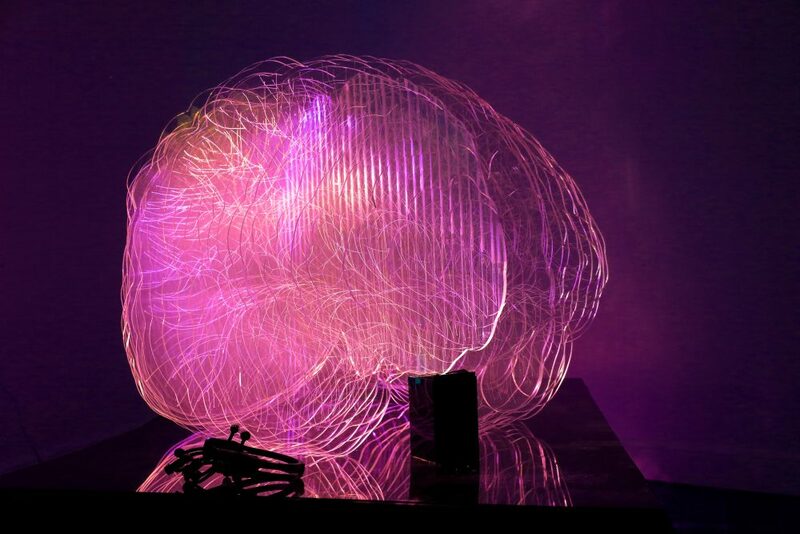 The brain sculpture lights up in response to changing brain activity transmitted from an EEG (electroencephalography) wireless headset. Everybody has a unique “neural signature” and Brainlight’s live vibrant visualisation is unique for every user. As the participant views the colours on the Brainlight, their own brain waves change in response to external stimulus. Some can even start to gain control over their mind, setting up a feedback loop of response, reaction, observation and response. Laura Jade is an Australian illumination artist and interaction designer whose work fuses the multidisciplinary fields of art, biology, illumination design, neuroscience and BCI (brain-computer interface) technology to explore new ways to perceive and interact with our inner biological processes. She is an early career artist, but is gaining an international profile, having recently exhibited at the 2016 Ars Electronica Festival in Linz, Austria, as well as presenting a keynote demonstration of her project Brainlight at the ‘Hoy Es Diseno’ (Design of the Future) conference at ICESI University, Cali Colombia in 2015. Laura’s cross-disciplinary background includes degrees in fine arts, biology, science communication, museum studies, curation, lighting and interaction design. Laura was recently an artist in residence at NES studio’s in Iceland continuing her research connecting neuroscience and bio-rhythms and electromagnetic fields.